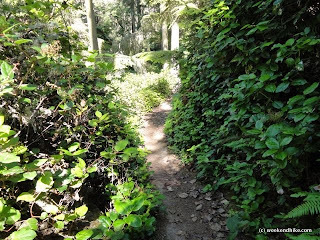 This is one of those "BEST of" hikes mentioned in most local Seattle hiking books including this book. With the views from the Bluff trail, I can see why -- especially on a nice sunny day. 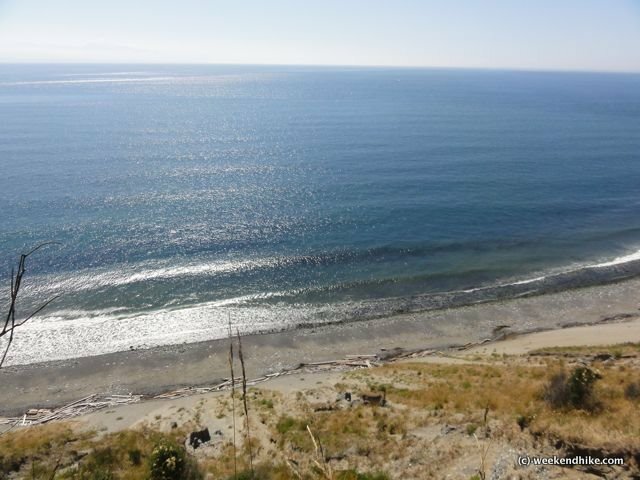 This is a somewhat easy 3.2 mile hike starting from one of the beach picnic parking lots. While the hike is often mentioned as "easy" - you do climb, decend and climb again a couple times during the hike, so small kids might get a bit tired. 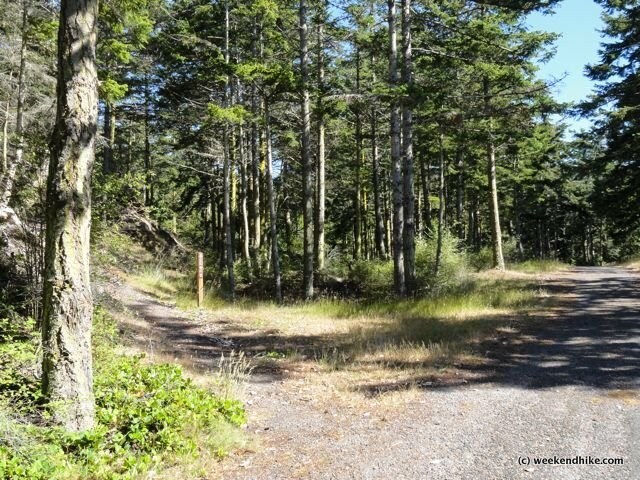 You can spot the trailhead from the opposite of the sign at the Parking Lot. You may want to bring a Park Map or this book. There are a number of intersections and interconnecting trails within the park so it can be a bit confusing. 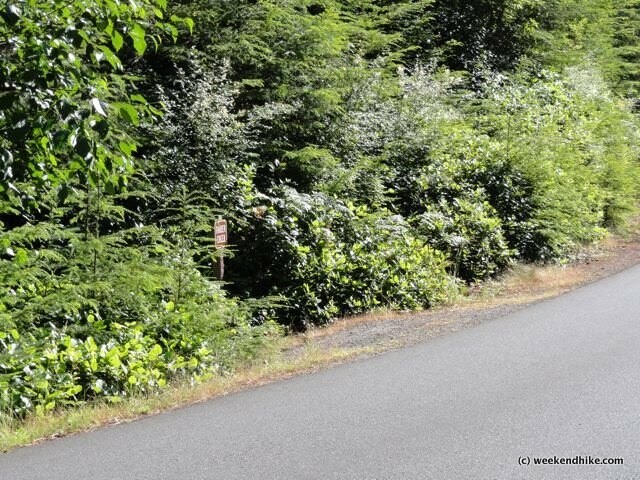 The PNT quickly leaves the beach area and heads right into the forest toward Lake Pondilla. Be sure to turn right at the first intersection you encounter. 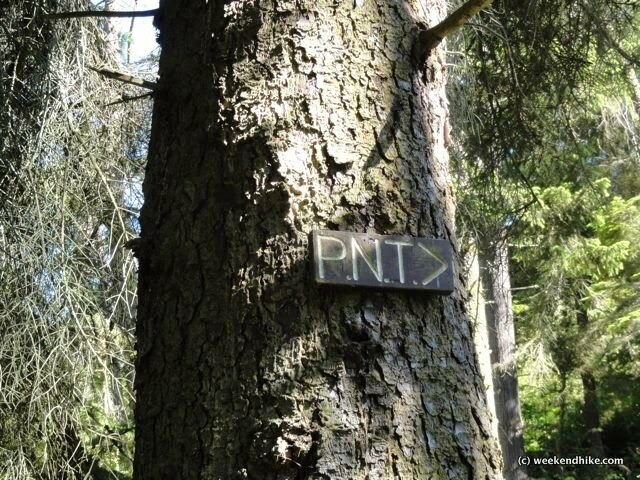 The PNT sign is high on a tree, just look for the wooden marshwalk way. The PNT is a fine trail, a bit narrow, but very enjoyable. 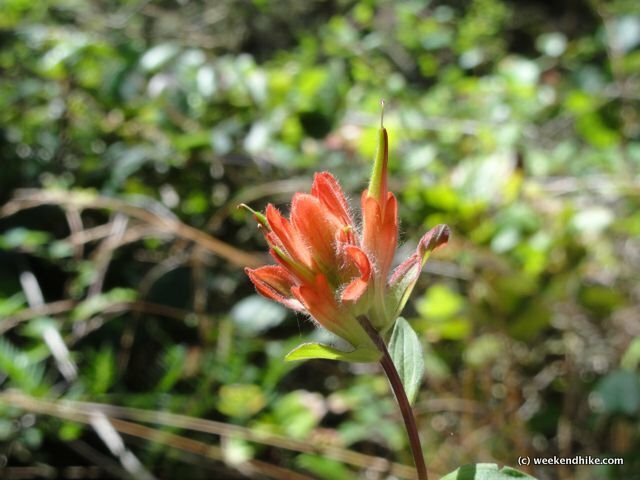 Along the way, I encountered some Indian Paintbrush in bloom, a nice bit of color along a mostly brown and green scenery during the first half of this hike. After passing high above Lake Pondilla, the PNT meets an old roadway, turn to the right, then look for the Kyle Kettle's trail off the to left. The Kettles trail heads uphill into a barren-looking landscape, but filled with trees. 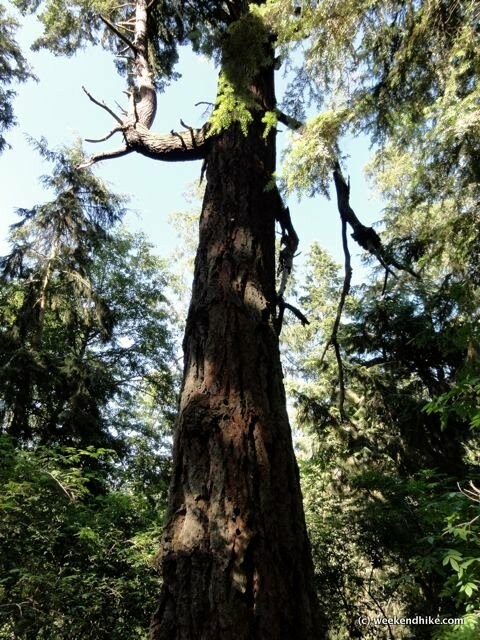 At the top of this ridge, you have the OPTION of taking the Grampa Tree Trail. If you have extra time, I guess the Granpa Tree trail is worth the time. 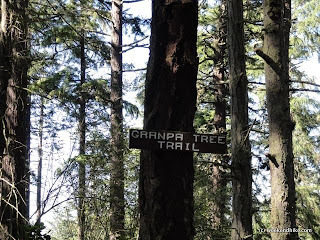 The Granpa Tree trail runs parallel to (and ends up back on) the Kettle's trail, so if you want to just stay on the Kettles trail you can. 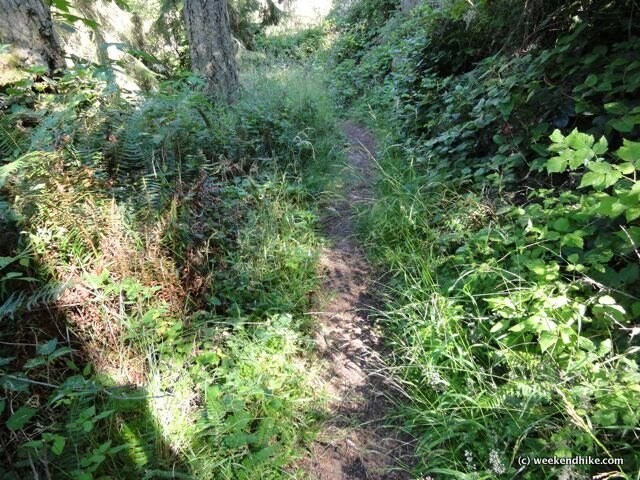 I found the Granpa trail a bit overgrown and ran into more insects on this part of the hike. You will soon spot the Granpa Tree (a Douglas Fir). After rounding under and back around this huge tree, you will soon climb back up and over the ridge to meet again with the Kettle's trail. The Kettles trail meets up with the Campground roadway. 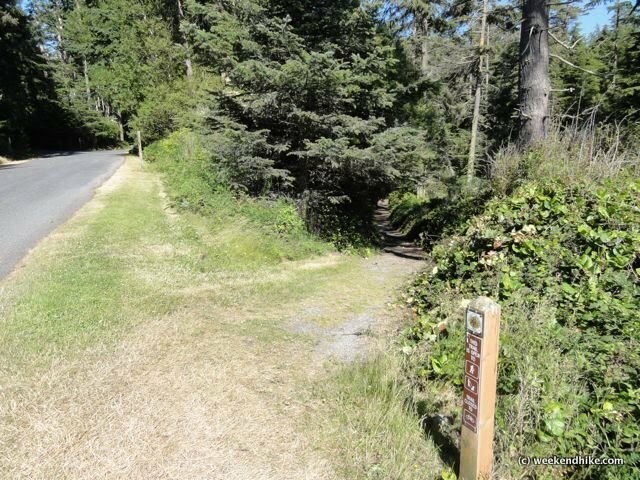 Look to the right for the entrance to the Raider Creek Trail. 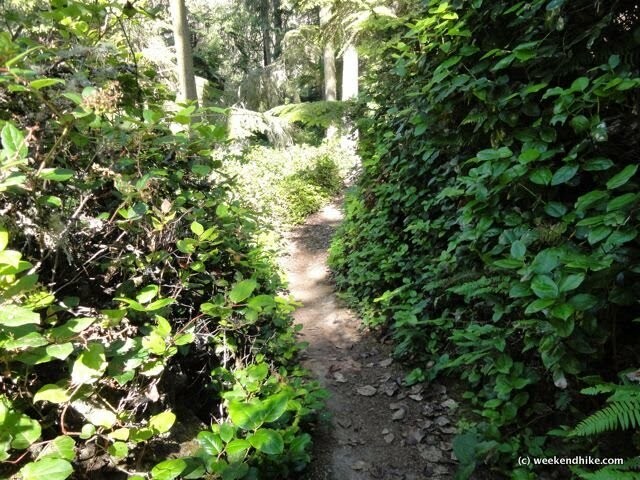 This section of the hike can be a bit confusing as you connect through a number of trails. 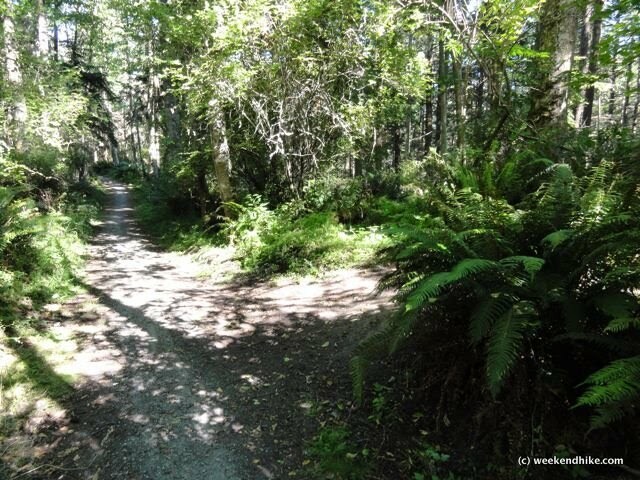 From the Raider Creek trail, turn right on the Campground trail, then a quick LEFT on the Forest Run trail. At a large triangle intersection, keep RIGHT on the Kettles trail. Then stay to the LEFT on the Hokey-Ka-Dodo trail. 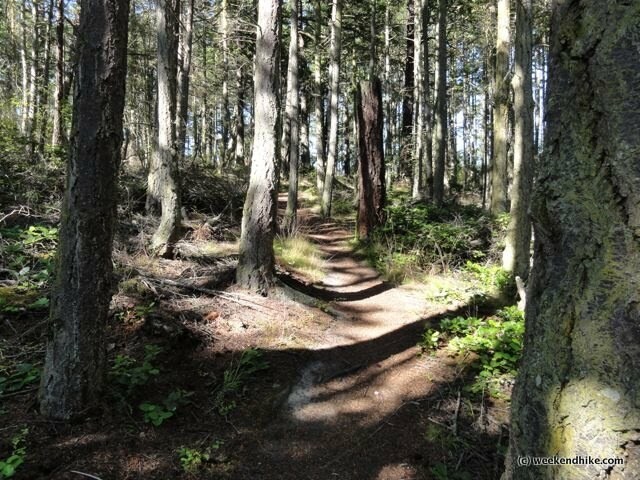 Soon you will reach the Bluff trail -- and you will know it! 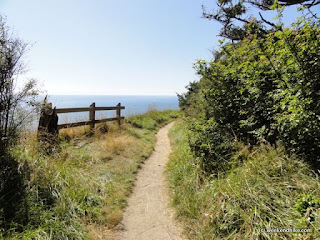 At this point of the Bluff trail you are several hundred feet above the beach below, offering outstanding views of the Strait of Juan de Fuca. This section of the trail can be windy, but on the day I was there it was fairly calm and sunny. The Bluff trail skits along the Bluff next to the main camping area (sometimes heard, but not seen). Soon you will reach a great open space -- a great place for kites. The trail passes a picnic area as well the Battery 248 spot. 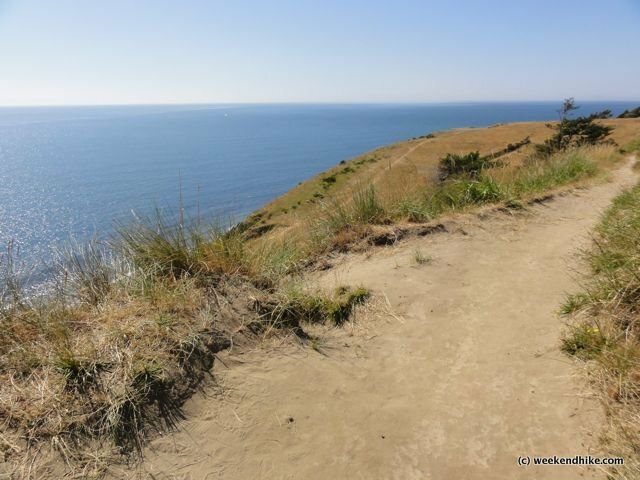 Along the final leg of the hike, the Bluff trail turns a bit away from the cliff -- although there are some spots to take in the view, but be careful of the edge. 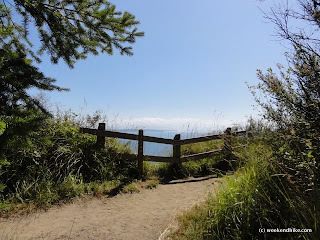 There is one last intersection before the parking lot, just stay on the beach side trail. Of course at the parking lot, take in the nice beach area with tons of driftwood to make the spot a very nice scene. 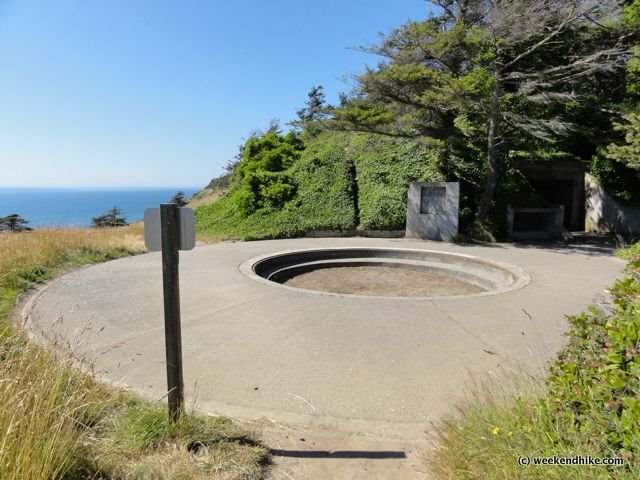 A nice hike for those staying a Fort Ebey State Park. 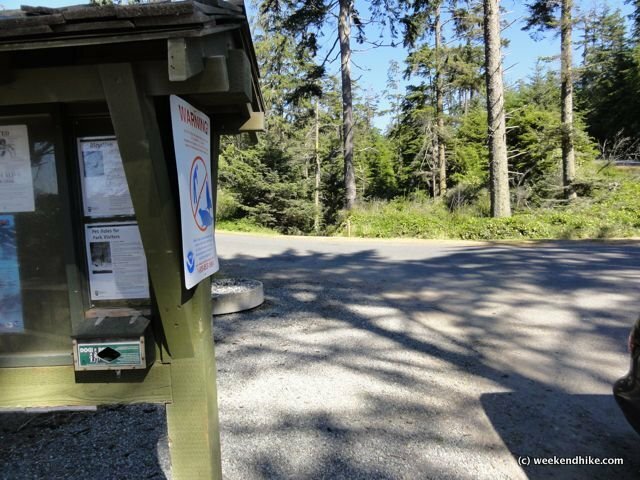 The hike can be started from the campground area on the Bluff trail. Past Lake Pondilla the hike is a bit bland (but shaded in case its a hot summer day). 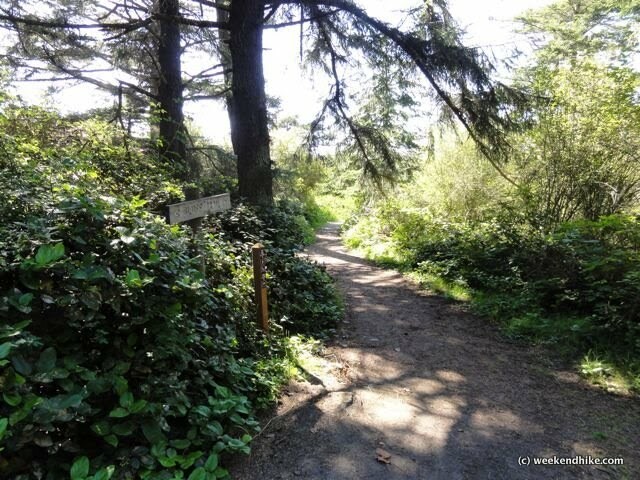 I would recommend bringing a good map or this book: 60 Hikes Within 60 Miles: Seattle: Including Bellevue, Everett, and Tacoma with you, as I got on the wrong trail a couple times by not reading the route description closely enough. The Bluff trail makes this hike a "best of" for sure. Trail - Loop, dirt trail, narrow in parts. Bluff trail is mostly sunny, the other trails are covered by trees. Well marked and maintained. Getting There - From Seattle, take the ferry from Mukilteo to Clinton. 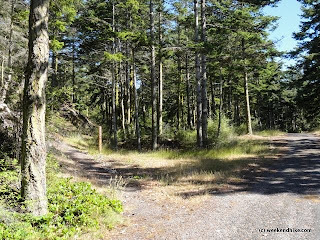 Head north on highway 525 for 30 miles, turn Left on Libby Road -- follow the signs for the park "picnic" area. Turn RIGHT after passing the Ranger Station. Look for parking on the beach side parking lot. 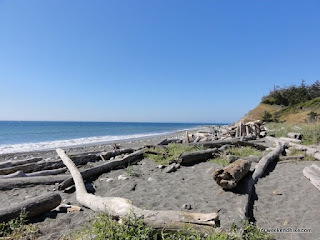 The PNT trail is opposite from the beach side of the road. (Park Map) Note: the ferry is fairly frequent, but can get busy on Summer Fridays/Sundays. An alternate route is via Highway 20 through Deception Pass. 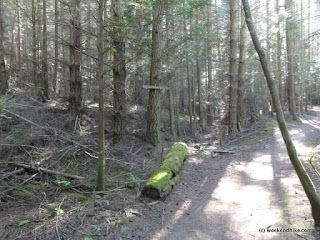 Other Trails - Over 20 mile of trail in this park and the nearby Kettles Country park.